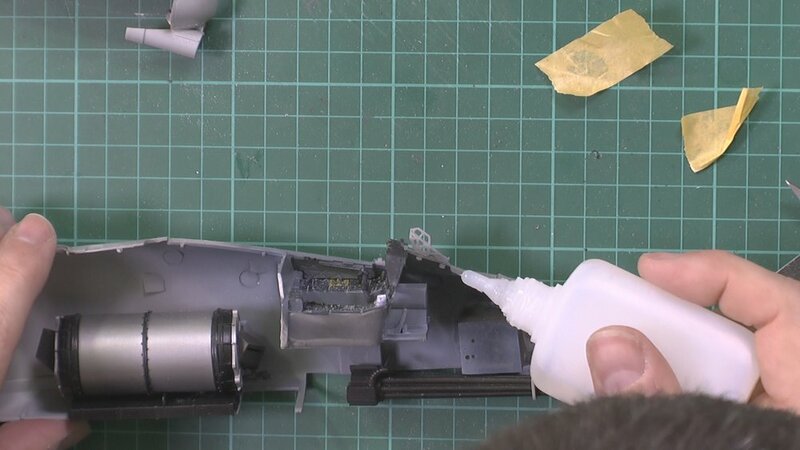 In Part Two we install the resin parts and build and paint up the gun. In Part Three we work on the cockpit, painting and weathering and the Photo Etched Panel. 17:30 Installing the Photo-etched parts to the panel. 16:00 Installing all the cockpit and bring the fuselage halves together. 00:00 Making a CA Filler and adding talcum power for easy sanding. In part Ten, we add the Dark Ghost grey color and the used our custom mask set from Ron to are the markings. In Part 13, we add further weathering to the paint with post shading and then scratch build the Lime line formation lights. Then we build, paint and detail the gear. In Part 14, we finish off the undercarriage with weathering and fixing in place before putting together fitting the Photo-Etched Master's Gun. In this final part, we bring the whole thing together and finish off the cockpit and add the wiring hanesess and the arn the Hog all ready for the final reveal. 21:13 Final parts fitted and the final reveal.